Alaiyna B. Bath and Body: Black Raspberry Vanilla Soap using a new design technique. 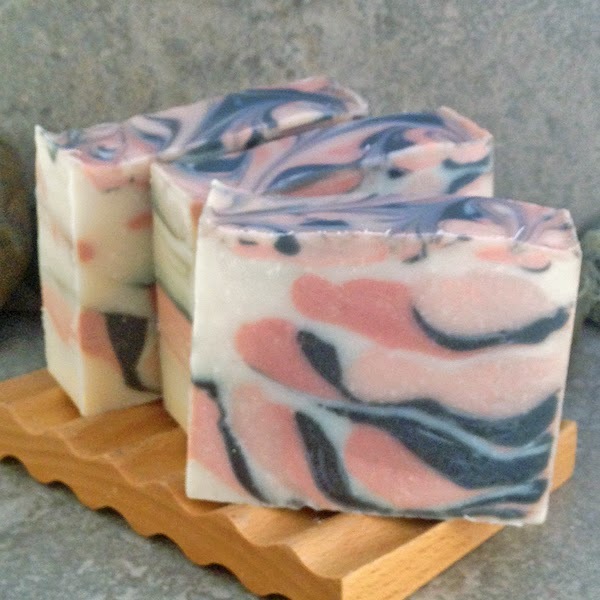 Black Raspberry Vanilla Soap using a new design technique. I just love how this new soap turned out. Layers of ivory, black and two shades of mauve to match the lovely Black Raspberry Vanilla Fragrance Oil from Brambleberry. To get this design, just place a solid piece of wood, a book - just about anything underneath the edge of one side of your log mold to angle the mold. Separate your soap into as many colors as you would like while it is still fluid (homogenized but not beyond a very, very thin trace). Scent and color each one. Pour the first color down the side of the angled mold, then the next color on top of the first and so on. Keep adding colors until the mold is filled (leave a bit of soap to finish off and decorate the top). Remove the item you placed under the one side of the mold. Tap the mold on the table to remove any air bubbles. Add any remaining soap to the top and swirl the top colors for a finished look. Next time I will do this soap in various shades of yellow as it almost looks like an abstract sunshine! 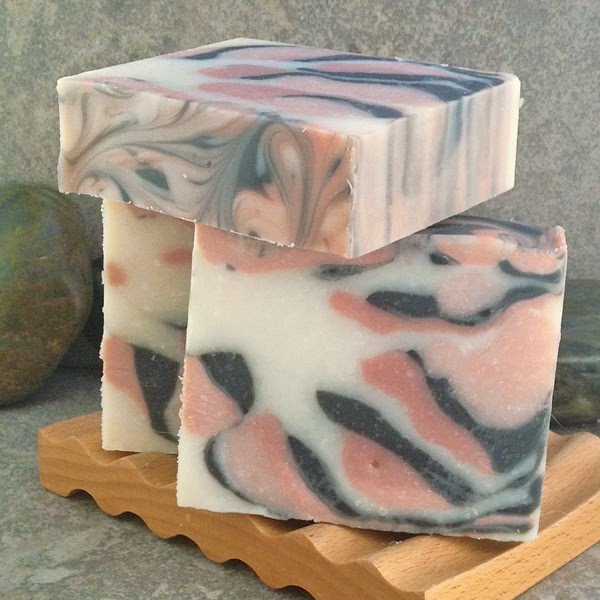 You want you soap somewhat fluid, but not too fluid that the colors swirl together when pouring them into the mold.